Was a pleasure today to speak about how Condé Nast is making money using third-party distribution services. The presentation was recorded, and I’ll update this post when it goes live. Slides can be found below. I had a great time presenting at WordCamp SLC this year. I wanted to speak about something that has been an interest to me lately, Working with WP_Query, and making it more performant. Also touched on working with Express, Node.js, and jQuery. Just a little wrap up from WordCamp Vegas that was this last weekend. I had a great time, I am always impressed with the WordPress community. Open, caring, and would literally give you warm cookies just for driving down to Vegas. I also enjoyed hearing the flamboyant Eric Marden and hearing him speak on DevCraft: Best Practices for WordPress Teams. I never worked professionally as part of a dev shop, so his comments were interesting on a lot of levels. Taking a lot of his critique and commentary to heart, hoping to become a better developer as a result. I guess this brings me to the crux. No one is a perfect developer. For all of the WordCamps that I have been to, (been to eight now in the last two years) there is always something to learn. For the $20-$30 that they normally cost, there is no better way to spend a Saturday learning from everyone around you on how to be a better developer, better blogger, or better designer. Just getting started or looking for a little help with your WordPress questions? We’ll have a Genius Bar where you get some help. Already a WordPress whiz? Come volunteer at Genius Bar! Contact us and we’ll put you on the list. And finally, at WordCamp Utah 2010 we’ll get an answer to that question you’ve always wondered about, Will WordPress Blend? If you are interested in sponsoring, presenting, or helping make everything run smoothly please let us know – we are still looking for help with video recording in both rooms so if you know someone who can help in that area we’d really like to hear from you. In an effort to get the seizure inducing photo a little further down the page, I offer a new post. Yours truly was interviewed during WordCamp Utah offering a some dorky, nerdy, lame, geeky insight into what I did for the streaming. You can check out the post over at the CouchCast page, or you can check it out below. As a side note, I am after Lance Willet, and before Matt Mullenweg. That’s right, I am before more important then the founding member/CEO/President/Bomb.com of WordPress. I used two, Canon HV30 video cameras. These were tied into two of my computers, an Apple MacBook Pro, and an Apple iMac. I ran some microphones into an MultiMix 8 Firewire Mixer. This gave me an eight channel mixer that I could run some bump music, a Rode VIDEOMIC Mic for house audio, and a podium mic. I took the mix out of this, and ran it into the mic input of the iMac, my primary device. When I was testing, I ran into a bug that only allowed for the first two channels to be mixed when I was going into the computer via FireWire, so I ended up taking the mix out into the computer with 2-1/4″ mono jacks into a 1/8″ stereo jack. This allowed me to do a full eight channel mix (not needed) into the computer. I created a UStream.tv account, and then started a broadcast on both of the computers. When you start the broadcast, it will ask for access to your camera, which you should grant. You then change the access from your web cam, to the firewire channel, or the DV video. Whichever one shows the camera. From there, you are ready to start the broadcast with a solo camera, and audio through the mixing board. If you really want to boost our Ustream street cred, then you use two cameras, and CamTwist for graphics. I mentioned earlier that I had two cameras, and two computers for streaming. This is important if you want to switch the video. More about that in a second. CamTwist is an application that works as an interrupt to the video flow. As such it allows you to add video effects, titles, and is able to not only use your camera, but pull other sources into the mix like your desktop (handy with demos and powerpoints) and movies. The secret to getting CamTwist to work is having the all of the browser windows shut down, then starting up with CamTwist already running. Once you have enable the broadcast, select CamTwist from the video control menu, and you are ready to go. Before the event, I made title cards, and a watermark that I could leave as overlays through the event. This can really add to your production value. Lastly, to enable multiple cameras on the same stream, you need to search for the name of the other stream that you are broadcasting, and add it to your stream as a cohost. Then, resize that window to match your other video source. You can then switch between the two sources. In the live events that I have done, I found it useful to have one camera on the powerpoint, and one on the speaker. In the future, I would prefer to have the powerpoint from the speaker, and then just use a laptop streaming that only. Then I could get a cleaner video of that source. So, that is what I did. Have you done anything like that before? 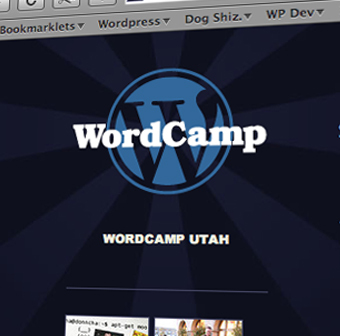 I am really excited to be part of WordCamp Utah this year. I was asked by Joseph Scott to handle video production for the event. To make this event extra special, and more open and accessible to everyone, I have decided to stream all sessions using UStream.tv. The official channel can be located here. To add to the awesomeness of the event I thought I would detail some of the technical details surrounding doing to a multicam, livecast of the event. Details to follow. Why? Bring together people interested in WordPress, blogging (and the web in general) to talk about what’s possible, where’s it going.